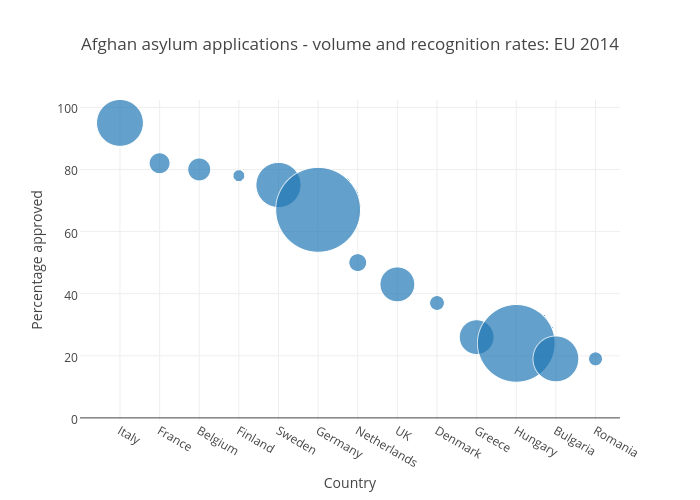 Joedyke's interactive graph and data of "Afghan asylum applications - volume and recognition rates: EU 2014" is a scatter chart, showing Percentage; with Country in the x-axis and Percentage approved in the y-axis.. The x-axis shows values from -1.0084052903480702 to 12.617795248243286. The y-axis shows values from -0.6850222265116841 to 102.36787708046957.